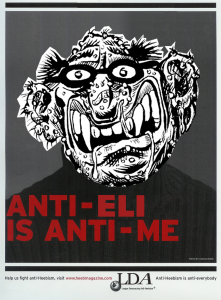 Heeb wishes a hearty mazel tov to cartoonist Eli Valley and welcomes him to our little family of Jewish satirists who have been condemned by the Anti-Defamation League for being brutally and graphically frank about subjects which the organization’s national director Abraham Foxman selectively deems beyond the pale. The cartoon, “The Hater in the Sky,” published by the progressive Israeli magazine +972, depicts Israeli Prime Minister Benjamin Netanyahu goading President Barack Obama into sacrificing life, limb and dignity for the state of Israel. Despite the President making even the gravest of sacrifices – going so far as to allow his limbless torso to be sodomized by Netanyahu – the Prime Minister and pro-Israel hawks continue to doubt the authenticity of the President’s commitment to Israel. “Cartoonists usually have much greater leeway of criticism because they are cartoonists, but even within that framework it crosses the line,” Foxman said. Tasteless, self-hating and blood-libelous – what’s not to like?